This is Victoria Hislop’s sixth work of fiction, and rather than a novel it is a series of short stories and vignettes framed within two narratives. Filled with photographs of Greece, it’s a charming book designed as the ideal read for busy people or those on holiday. The comforting, conversational style means it easy to put the book down for a while and then pick up the threads of the stories again. It opens with Ellie, a newcomer to London who is feeling lonely and isolated, wondering where the bright lights and beautiful people are hiding. One day a postcard arrives from Greece, signed ‘A’. Ellie assumes that the postcard is meant for a previous occupant of her rented basement flat, but the postcards keep arriving and Ellie begins to look forward to them. The collage she makes of them brightens her miserable home and she is dejected when, after six months, they suddenly stop. Although Ellie is the first frame for the short stories, Hislop does not dismiss her with a thumbnail sketch. Ellie is given a backstory, and her feelings of isolation are authentic. The postcards from the mysterious ‘A’ fill a clearly outlined emotional void and Ellie’s sudden decision to see Greece for herself does not feel forced. Just as Ellie is leaving for the airport a notebook arrives and she stuffs it into her bags. 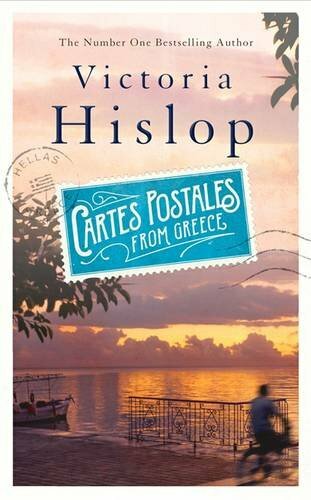 She soon discovers that ‘A’ has written it, recording his journeys through Greece and his feelings about the woman to whom he had addressed the postcards, who seems to have left him. So begins the second frame, as ‘A’ travels through Greece and relays the stories, myths and gossip that he hears. The stories range from funny to touching and scary, and each is a short, self-contained tale. 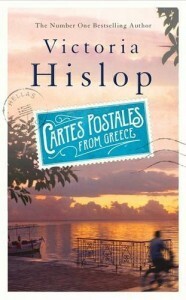 Hislop manages to convey the rhythms of Greeks speaking English without lapsing into parody, which is a relief. The character of the country comes through strongly as do the events that shaped it, such as the Turkish occupation and the atrocities committed during the Nazi occupation in World War II. The current financial crisis is well covered, as are the blood feuds of ancient and modern times. ‘A’ spills his anguish into the notebook as he tries to heal his heartbreak. Slowly he begins to put things into perspective, taking a more philosophical view of the break-up of his relationship. Greece, a beautiful and diverse landscape, works its magic and brings him a measure of peace. The many photos scattered throughout the book show Greece in its various guises. At times if feels as if there are perhaps too many images. It is said that radio has the best pictures and that often applies to books too. The book’s ending is rather too neat and tidy but it will appeal to romantics. ‘A’s story may be sad but the book closes on a positive note for him and Ellie.